The Bronx Opera Company has a worldwide reputation for quality opera productions. Their productions are sung in English which broadens their appeal and tickets are very reasonable with discounting for seniors and students which makes their performances accessible to a wider audience. The Bronx Opera Company joins the Bronx Rotary Club for a meeting each December and presents an operatic holiday program. The Rotary Club of the Bronx has had a relationship with the Bronx Opera Company for over 40 years and has given them grant money to help with their elementary school programming. In 2017, the Bronx Opera Company celebrated its 50th season of providing incredible music and culture through its programming. Tenor Daniel Foltz-Morrison and soprano Leslie Swanson from the Bronx Opera Company led a spirited holiday carol sing-along at Bronx Rotary's holiday party at Marina Del Rey in 2017. 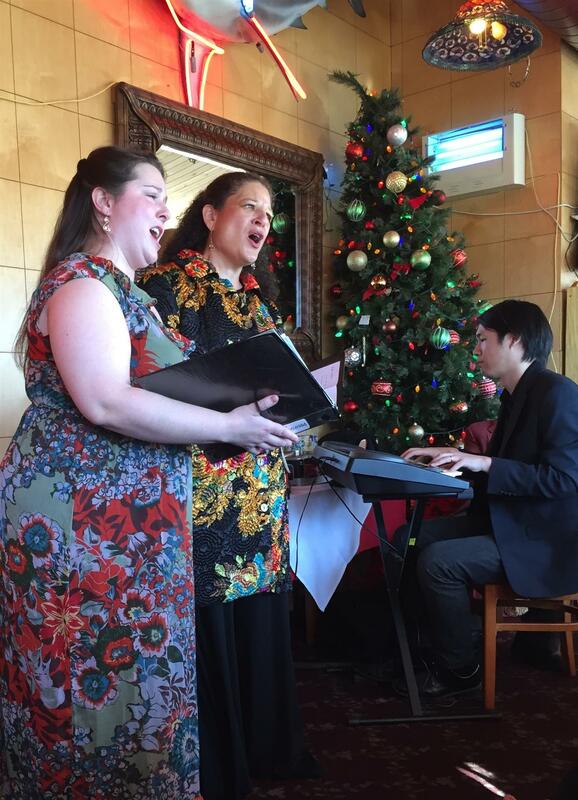 Halley Gilbert and Leslie Swanson got the 2015 holiday season off to a great start with the accompaniment of Shawn Chang on keyboard. 2015-16 President Toba LaCrown (l.) and Miguel Santiago present a grant check to Bronx Opera Company's Founder and Director Michael Spierman (center).